This book was one crazy, awesome adventure! It starts with an overachiever and a jock working on a school project, and ends up with an unlikely group of seniors stranded in Mexico. 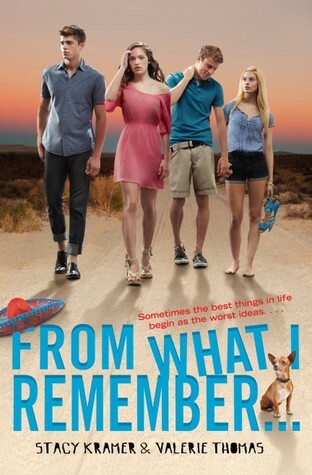 From What I Remember has a killer prologue and once I read those first few pages, there was no way I wasn't going on this adventure with Kyle, Max, Will and Lily! When we first get to know the characters, Kylie is the typical overachiever, high school valedictorian and basically anti-social. Max is the typical popular jock with good looks and lots of money. Will is a gay kid who does everything he can to make sure everyone knows it and knows that he's not ashamed of it. Lily is popular, catty, rich and dating the most popular guy in school. Of course, no one is ever who they appear to be on the surface and we can thank a crazy, accidental trip to Mexico for us being able to really get to know these characters. Kylie's computer get's stolen while her and Max are working on an end of the year school assignment. Of course, the computer is where Kylie's valedictorian speech is and she refuses to lose it. Her misguided chase of her computer, leaves her and Max trapped in the back of a moving van and crossing the Mexican border. After some scary and action-packed moments, they find themselves in Ensenada. Kylie's dad is from there and they end up a bar owned by an old friend of his. And that's where the adventure really begins. This story actually has a lot of layers and loads of character development in the four main characters. We get to see them open up and embrace what they really want in their life. No matter how pompous, bitchy, tightly wound, obnoxious or boring the characters may have seemed in the beginning, by the end I felt connected to all of their stories and I cared about what happened to them. This book was such a fun and crazy trip. You've got car chases, dolphins, plenty of drinking, mexican weddings, and an amazing cast of secondary characters. This is a story you definitely want to pick up, and I definitely look forward to more from these ladies. Enjoy the ride!